I lied. 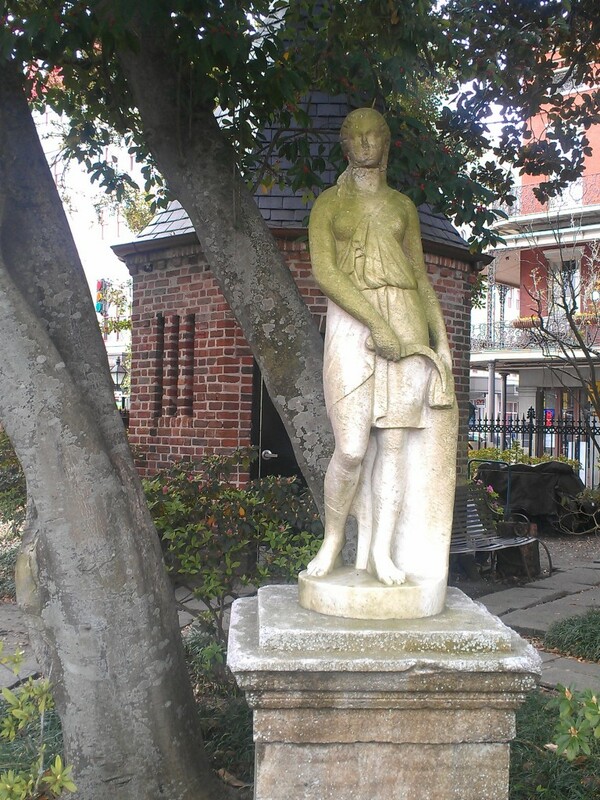 I mentioned on the last New Orleans serial that it would be my final post about our adventures. I had too much more to share. 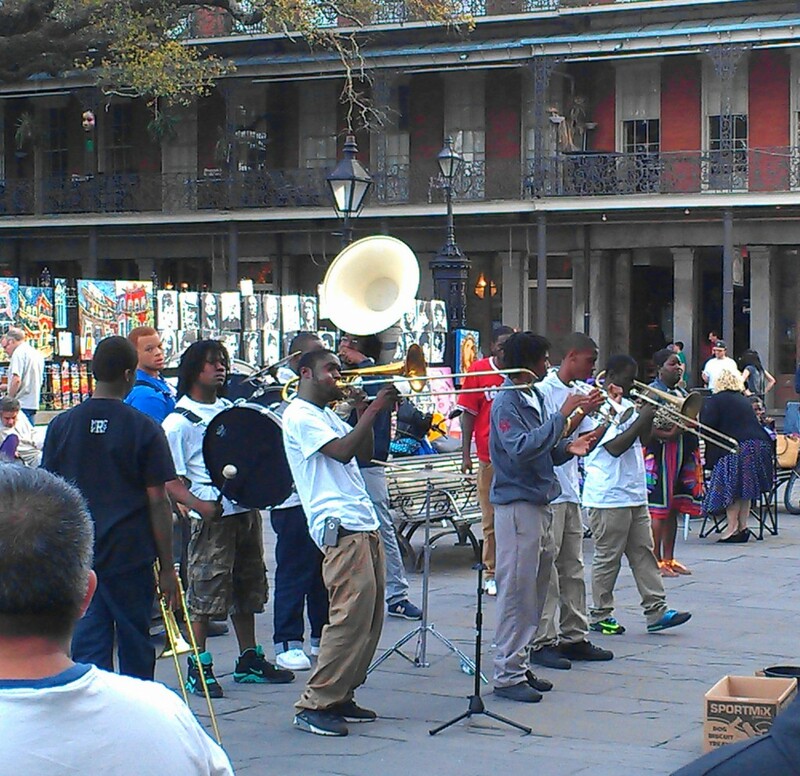 I loved people watching at Jackson Square. It was so serene in this park. Even with carriage drivers trying to sell rides, the street musicians, and the buses of tourists, it was an oasis. Do you think Walt fashioned the castle after this cathedral? I found a new affinity for oysters. 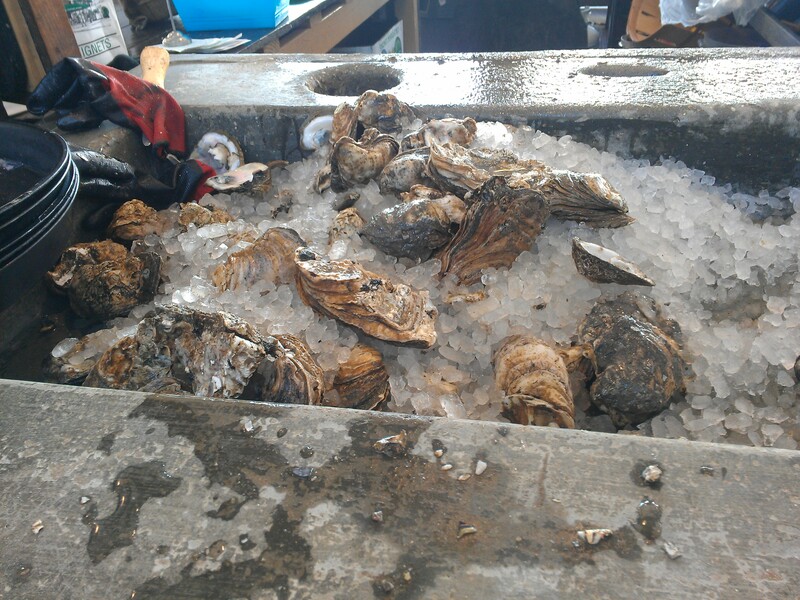 Oysters at the French Market. I loved the music and vibes. Who needs to go to a club for music and dancing? You must, must, must have the spinach salad here: Fresh spinach, shaved red onions, fried Louisiana oysters, blue cheese, spicy pecans with warm bacon vinaigrette! 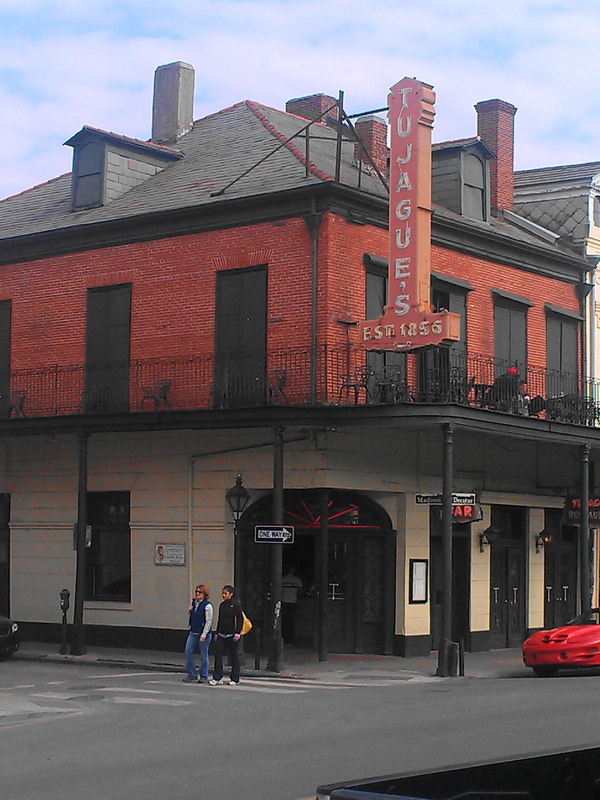 and Coquette (2800 Magazine Street). The Pickle Plate from Coquette. Tujuage’s is a white table cloth kind of place with an antique casual atmosphere. Coquette is in a hip part of town (Magazine St.) and was stupendous. I wish we had found it earlier. Ride the street car to the Garden District and it is just a few blocks away. 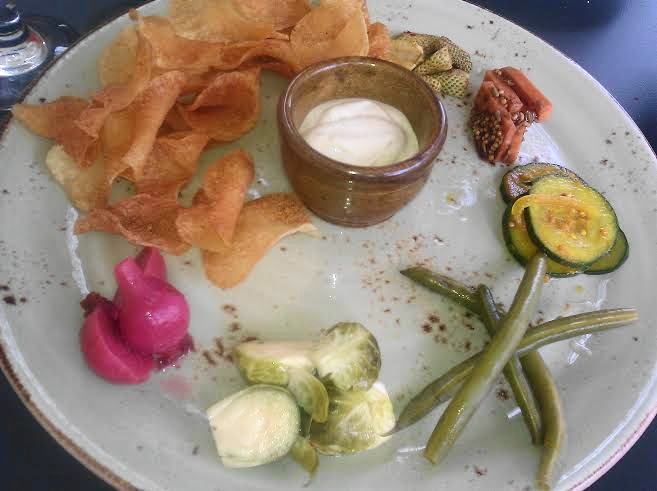 Well worth the trip, especially for this pickle plate: beets, brussel sprouts, green beans, bread and butter pickles, pickled sweet potatoes and pickled green strawberries. Yes, you read those last two correctly. These were wonderful. The sweet potatoes tasted like they had used garam masala and I could have eaten a ton of them. One of my favorite places is The Praline Connection, 542 Frenchmen Street, New Orleans, LA 70116-2024 (www.pralineconnection.com). New Orleans Creole and soul food. It’s not everyone’s type of food, check out the menu – you may want to try it. Their collard greens and the stewed chicken are great, but I was raised on this kind of stuff. Ralph & Kacoo’s (http://www.ralphandkacoos.com) 519 Toulouse St, New Orleans, LA 70130 is a great fried seafood place. My favorite is the stuffed crab, but their soft shell crab and the fried shrimp are also very good. They also have several grilled seafood dishes and a steak or chicken dish for those land-lubbers. WOW – I can’t believe I’ve taken this long to mention Central Grocery and the muffeletta (muff-a-lotta). This is a MUST, MUST, MUST try. 923 Decatur Street, New Orleans, LA 70116. This is pure New Orleans original. A fun place is Mulate’s (www.mulates.com ) 201 Julia St. New Orleans, LA 70130. This is a CAJUN restaurant. Well more than a restaurant. There is live Cajun music every night and the center of the restaurant is a dance floor. Dancing is encouraged, basic two-step is easiest. Fun, relaxing, and good food – seafood and non-seafood. A great dinner choice. It’s about a 5 blocks on the other side of Canal St from the French Quarter at the corner of Julia & Convention Center Blvd. You could walk there and back, weather permitting. Harrah’s Casino is between Mulates and your hotel, and makes a nice pit-stop on the stroll back. The Chartres House Café (http://www.chartreshousecafe.com) 601 Chartres Street, New Orleans, another casual place not far from your hotel. Good reliable food, varied menu – seafood, non-seafood, New Orleans, Cajun, sandwiches, etc. Nice place. You can sit near the street and people watch or they have a nice courtyard. Great place for lunch. If I had 1 day to eat in New Orleans, I’d have: the trio plate from Eat NOLA (because I could get all 3 in one place), a muffeltta, a roast beef po-boy (dressed with mayo), and Ralph & Kacoo’s stuffed crabs (fried shrimp second choice). To wrap up my food recommendations I’ll just say that New Orleans takes food seriously. A restaurant with bad food will not be open long. How do you want to dress, what type of food, and how long do you want to wait. Those 3 questions should narrow your choices quickly. Also, being in the Quarter, prices are higher, its expected. But try the small hole-in-the-wall places, don’t be afraid. They wouldn’t still be open if the food wasn’t good and they have more than just seafood on their menu. If you have time, check out www.nomenu.com by food critic Tom Fitzmorris. He has his must-eat lists, 12 best, best seafood, a Sunday brunch list (very handy if you want a special Sunday brunch), and restaurants by areas or by name, etc. His recommendations are usually really good. Things to do: Shop the French Quarter, tons of little clothing & antique shops. Hit the Rock ‘n Bowl (http://www.rocknbowl.com) on Saturday night. This is a bowling alley/bar/club. If you get there early, you may be able to get a lane and bowl; the band plays, you bowl, dance, bowl, dance … a fun time. If you can catch The Iguanas there do so. They are a New Orleans Latin/Caribbean band. You can get tickets on-line for $12. Bowling optional & extra. The Louisiana Museum at the Cabildo is excellent. I don’t remember the cost to get in. 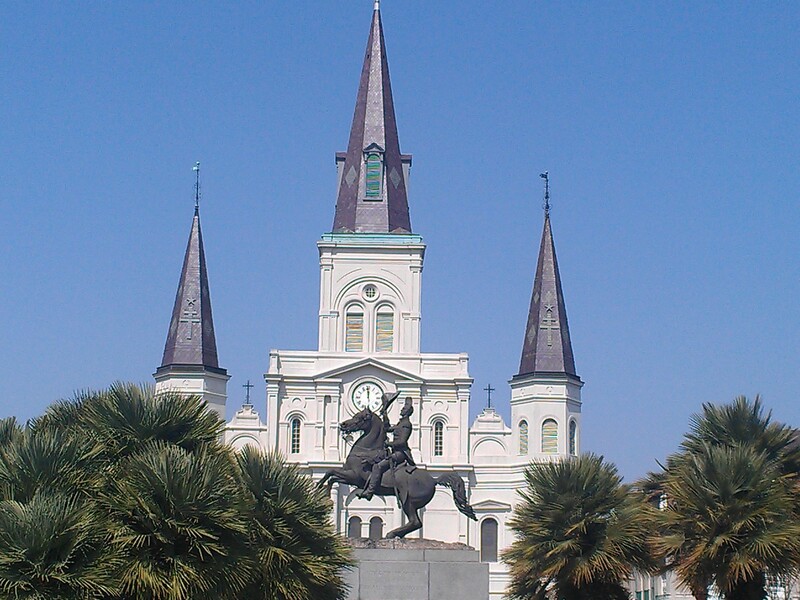 Next door is the St Louis Cathedral; you can go in and look around – beautiful church. Both are at Jackson Square. Before buying souvenirs, take a walk through the French Market on the far end of Decatur away from Canal St. Typically you’ll find the same stuff cheaper: t-shirts, knick-knacks, etc. Ride the St Charles Ave streetcar (it’s not a trolley). Nice relaxing way to spend some time. However, unless you’re headed somewhere along the route, it may be too much time. Take a tour – cemeteries and the haunted night tours are popular. If you’re looking for jazz, check Snug Harbor’s site (http://www.snugjazz.com). You can get tickets online if still available. Snug Harbor is THE place for jazz in New Orleans. They have a restaurant, but I have no idea on the food there. A great relaxing Irish Pub is The Kerry, 331 Decatur St., New Orleans, (http://www.kerryirishpub.com). Live music most nights – especiallon on the weekends – not much on their website. “Gambit” is a weekly paper, kind of like “Urban Tulsa”. You should see it at the airport, in the lobby of the hotel, or anywhere. They’re free and have current listings for everything – music, arts, events, shows, etc for the week. Their website is www.bestofneworleans.com and is pretty handy. There’s another publication, “Where Y’at!”, but its printed monthly, and I’ve found that venues and acts may change. So I stick with Gambit. Also, www.nola.com is the web site for the Times-Picayune, New Orleans’ newspaper. It also has a date searchable events page. I really appreciated all his sage advice and I am saving this list for our next trip. 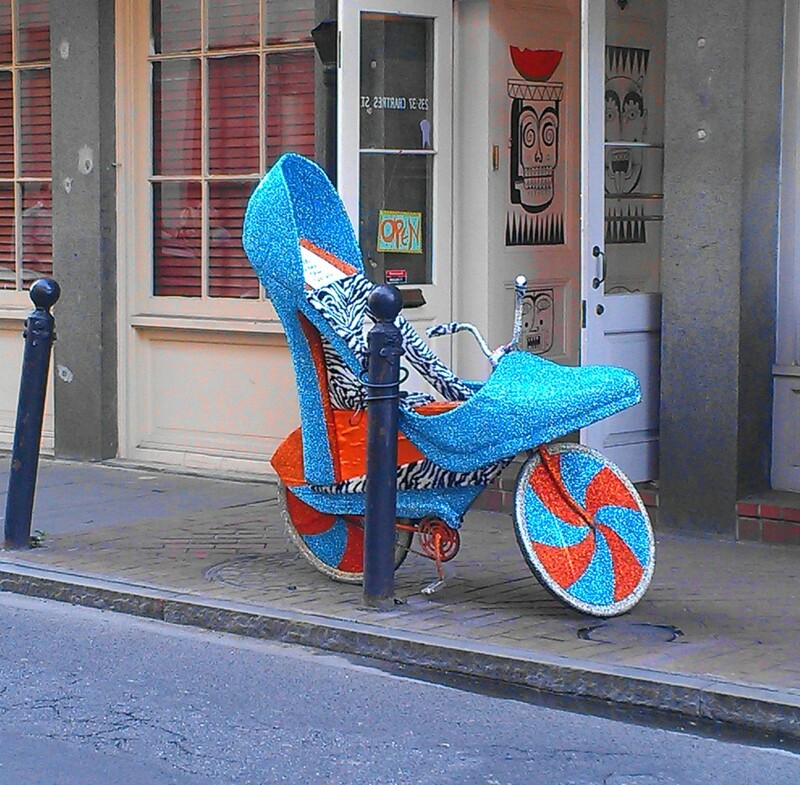 Hey, you never know what you will see on the street in NOLA. Thanks for listening and this is officially the end of my NOLA rant. Oh no! It can’t be over! Thank you so much for sharing as much as you did though. Seriously, I loved every photo (and that last one of the bike is awesome) and description that went along with it. I’m curious about that pickled plate. Is that pickled Brussels sprouts? I’ll bet they were fantastic. Thanks for letting us share your great trip. I loved seeing all the photos, especially the museums. Such a fun trip! It’s been years since we’ve been to NOLA…you’ve made me want to visit again! I think you should plan another trip, Liz. So fun to travel vicariously though you and your great photos. 😉 I am sorry it is over–you made me really want to get myself to NOLA someday soon. I hope you get to go, Deb. Thanks for all of this NO information. I’ve loved the posts. I’ve only been once, the year before Katrina, and pre-blogging. I adored the city and the food. I really want to go back. Thanks for taking the time to share and upload all of these photos. It will be a great log for you to look back and reminisce. I highly recommend a trip as soon as you are able!!!!! I can never get enough of New Orleans! Such a great place. Fun read — thanks so much. As stated, I already have a list of to-dos that we didn’t get to on this trip! Can’t wait to return. You can tag along anytime, Louise! Please don’t apologize for all of these NO posts. They have been terrific and now I have a few new restaurants to check out the next time I go. Thanks! I hope you will post about your trip when you do make it to the Big Easy!